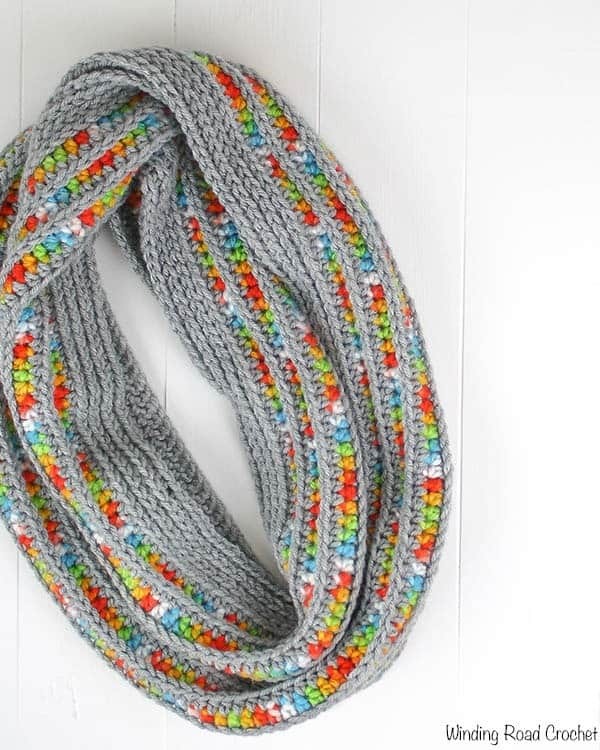 Rainbows and Rain Clouds Infinity Scarf is the perfect way to combine bright colors with a neutral gray. Fall is fast approaching and that means scarves, hats and mittens are on our hooks! This is a fast and fun project that would compliment any fall and winter outfit. I bought some of the Big Twist Rainbow Classic yarn when it was on sale with no real project in mind for it. It became a challenging yarn to work with because the yarn changed color with every stitch and made for a busy looking yarn. To tone this beautiful yarn down I decided to do stripes with a neutral grey and I just love the results. Add a little raised texture and this scarf took on a very unique personality. Now let;’s get this project started! Not ready to start right now? Or Save this Project to your Ravelry Queue! New to Winding Road Crochet? Check out all my free patterns here! I have included two sizes: Adult and Child. The adult size infinity scarf has a circumference of 72 inches and the child size has a circumference of 48 inches. You can make the scarf longer or shorter by adjusting the starting chain. Any number of starting chains will work with this pattern. You will not turn at the end of each row. Not every row is worked in the third loop. I carried my yarn up the inside of the scarf to avoid having extra ends to weave in. Ch 216 for Adult Size (or 144 for the Child Size) Slst to first ch. R1: Ch2, Hdc in each ch, slst to first hdc. R2-3: Ch2, Hdc in the third loop of each stitch, slst to first hdc. R4: Ch2, Hdc in the third loop of each stitch, slst to first hdc. R5: Ch2, Hdc each stitch, slst to first hdc. R6: Ch2, Hdc in the third loop of each stitch, slst to first hdc. R7: Ch2, Hdc each stitch, slst to first hdc. R8: Ch2, Hdc in the third loop of each stitch, slst to first hdc. R9: Ch2, Hdc each stitch, slst to first hdc. R10: Ch2, Hdc in the third loop of each stitch, slst to first hdc. R11: Ch2, Hdc each stitch, slst to first hdc. R12: Ch2, Hdc in the third loop of each stitch, slst to first hdc. R13: Ch2, Hdc each stitch, slst to first hdc. R14-16: Ch2, Hdc in the third loop of each stitch, slst to first hdc. Fasten off at the end of row 16. Weave in your ends and you are all done! This scarf will very unique depending on the colors you choose. I would love to see what colors you decide to use for your Rainbow and Rainclouds Infinity Scarf! Share your photos by tagging me @windingroadcrochet and #ourcrochetjourney on any social media. Spookily, I started a crochet project just the other day (must be the change in the weather!) with a vibrant multi coloured yarn, I started mixing it with a grey but mine was too pale so I switched it for black. I’m still working out if I love it enough to carry on or if it needs a do over! Now I’m seeing your grey with the brights I’m thinking maybe I should give the grey another chance as it looks so good together! Finding the right colors can be hard at times. I do love the grey with they bright colors. No you will not turn on any rows. If you are talking about the hdc in third loop video, there two ways it can be worked, by turning and by working in the round. The scarf works in the round. I am working on a sweater that uses the hdc in the third loop and has you turn. Love this scarf! The use of the gray and rainbow colors together is very striking! Pinned for later.